Email for Business is an app that usually costs $4.99, but will be temporarily free for the next two weeks. What it allows you to do is send out professional looking letterheads and notecards to friends, family and colleges. After you write your letterhead or notecard, it is sent as an email to whoever you choose. You won’t have to spend time or money on physical letterheads anymore. 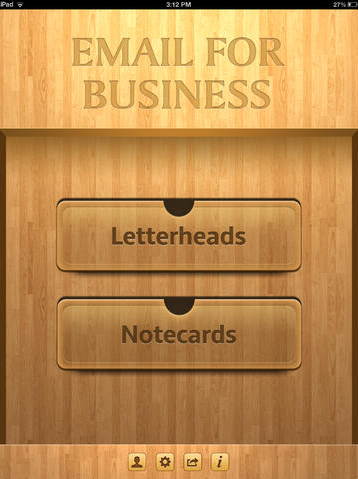 Email for Business even automatically fills in your name, business name, address and contact information on all notecards and letterheads you send. For $4.99, this app will save you a lot of time and money in the future. Don’t think you’re taking an easy way out with digital letterheads either. These days everyone communicates through digital means. Not to mention that email is faster than snail mail. So it just makes sense to use Email for Business as opposed to actually sending out letters when it’s not really necessary. Is Email for Business Worth it? As mentioned above, this app is totally worth it. It has an average of 4 1/2 stars in the app market, and is a really great solution for people that need to send letterheads or notecards from time to time. Thank you. Will recommend to others then!